On Wednesday, May 23, Justin Namau‘u was located in Kahikinui and placed under arrest on suspicion of Second Degree Murder in connection to a shooting incident on May 21, 2018, according to authorities. 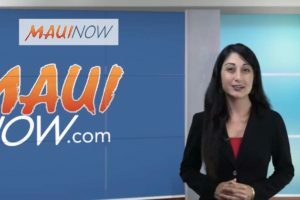 Maui police launched an investigation on the afternoon of Tuesday, May 22, following an alleged shooting reported at a home in the Kanaio area  of East Maui. Police say 42-year-old Justin Namau‘u of Kula was being sought for questioning in the case, and the area off Piʻilani Highway near Mile 17 was temporarily closed to the public…and sources tell Maui Now that special response units were on scene late into the night, searching for a suspect involved in an alleged domestic dispute and shooting incident. The investigation is ongoing. A 61-year-old visitor from Escondido, California was pulled unresponsive from waters off Lānaʻi  Tuesday May 22nd. The man had been swimming at Hulopoʻe Beach as part of a tour group from Maui that was visiting the island. Officials from the Maui Fire Department say someone swimming nearby noticed the man was floating unresponsive and pulled him to shore where bystanders began performing CPR. Firefighters arrived and took over lifesaving efforts until paramedics arrived a short time later. Despite all efforts, the man could not be revived and died at the scene. This was the 19th water-related fatality in Maui County this year — eighteen in the ocean and one in a freshwater stream. The sighting of a 12-foot tiger shark spurred the temporary closure of the South Maui shoreline  around Mākena State Park. The shark was seen around 10:45 a.m. Wednesday May 23, swimming in what was called a “non-aggressive manner” about 50 feet from shore in a southerly direction near the park’s south entrance. County lifeguards patrolling on watercraft and DLNR officers monitoring closer to shore did not see the tiger shark reenter the affected closure area, and beachgoers were allowed back in the water about two hours later. Locals and visitors alike can get great deals during Restaurant Week Wailea , happening now through Saturday May 26th. Nineteen restaurants around Wailea are offering fixed-price menus from $29 to $59 per person, from appetizers and salads to steak, seafood and dessert. A portion of every dinner sold benefits Maui Food Bank.